Meat bun machine is an ideal food machine for making the steamed stuffed buns with meat/vegetables and other materials inside the bun which is very tasty and nutrient. You can make steamed bread with fish stuffings, steamed bread with beef stuffings and so on. The whole stuffed bun making processing is Dough Kneading-Sheeting-Filling&Rolling-Forming. 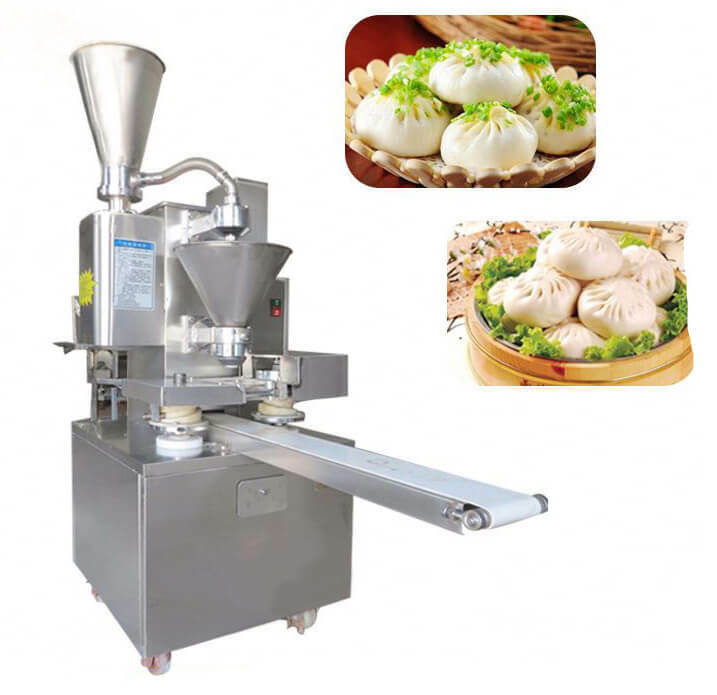 This machine is suitable to make Meat Bun, Vegetables Bun, Red Bean Bun, Small Steamed Bun, Rabbit Bun, Rice Cake with Bean Paste, Cutted Bun, French Bread, Filling Inserted Bread, Silk Bun, etc. 1. The product of various shapes. You can change different molds to make various shapes products. The rolling and forming can keep the natural texture of the dough so that the finished products are the same as hand-made with more delicate appearance. Chinese bun making machine is easy to assemble, clean and maintain. All parts contacting with food are made of food standard stainless steel. Equipped with PLC control system, this machine can be operated easily. 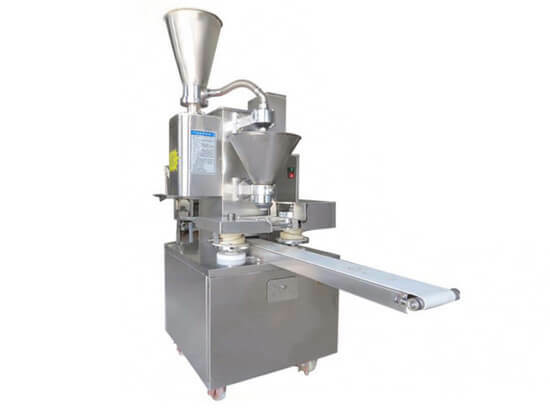 The thickness of dough wrapper, stuffing quantity and finished product size can all be set. 1. Meatbun making machine adopts the pressure-reducing system which would transport large capacity flour. 2. Improved turbo type transporting system makes the delivering process more smooth and easy. 3. Inflow point adopts double frequency control with High precision and efficiency. You can adjust the size of stuffing and dough automatically. 4. The machine is highly automated, microcomputer control, fully human control panel with quicker response speed and higher steady precision. 5. Meatbun making machine is made of high-quality stainless steel material, so the machine is durable and sanitary. 6. Meatbun making machine can make 2400-3000 steamed stuffed buns per hour. You can adjust the size of the buns freely. 7. Quantization is precise, and the operation is convenient. Only one person or two can finish the whole work. 8. The meat bun can be adjusted from 15-150g. 9. The size of the product is of high uniformity with a smooth surface.